There is typically an uptick in Lyme disease awareness and prevention efforts during the summer months, but don't let your guard down during the fall: that's when the adult population of deer ticks hits its peak. Researchers at Maine Medical Center estimate half of all deer ticks are carrying the Lyme disease bacterium, as well as other disease pathogens. "Ticks are very robust, very healthy, and very active right now," said vector ecologist Chuck Lubelczyk. According to Lubelczyk, the state does not collect or report tick population information until the end of the year, but based on anecdotes and his field work, he believes the tick population is spreading. "In Maine, New Hampshire, Vermont, Massachusetts and New York, what we are seeing are ticks moving inland," said Lubelczyk. 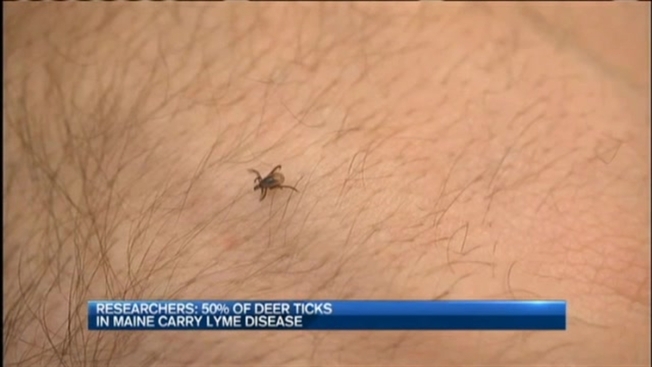 "The ticks are moving into areas that didn’t have tick activity five, 10 years ago." He said hikers, hunters and animals such as dogs and horses are particularly vulnerable this time of year, and he recommends regular tick checks after spending time outdoors. Lyme disease survivor Angela Coulombe says the tick trends are "alarming." "There still isn't adequate treatment or testing for it, and more people could end up like me: having a tick bite and never realizing it," she said. Coulumbe discovered her "bullseye” rash in October of 2007. It took her nearly two years to recover. She now runs an international support group called Lyme Buddies. “No one is immune to it, so everybody has to be vigilant and on board,” said Coulombe.